Let it be said at the outset that Sultan is not a conventional sports drama. At its core, it is a love story featuring Sultan Ali Khan and Aafra. 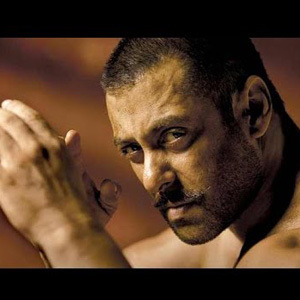 Sultan becomes a wrestler only because he falls in love with one. Yes, Anushka plays a wrestler too! The storyline is predictable yet robust, but where the director actually scores is in imbuing Salman’s eponymous character with human foibles. Sultan has faults and, refreshingly, is punished for it. Though out of his comfort zone here, Salman Khan delivers a knockout performance, almost acing it as the middle aged, out-of-shape former wrestler, who enters the ring again to resurrect his personal and professional life. As an ambitious, forward-thinking feminist, Anushka sparkles, matching Salman at every step. Leading the pack of supporting actors is new face Anant Sharma who, as Sultan’s best friend Govind, gives a great account of himself. Amit Sadh, too, plays it nicely as a sports entrepreneur. Then there’s the ever reliable Randeep Hooda, playing Sultan’s cynical trainer who must get him back into shape. But Sultan is a far from perfect film. For one, it is much too long and thus tends to get a bit repetitive. There are clichés galore in the first half, though it is entertaining. The music is lilting enough but there are too many song breaks, with characters breaking out into a jig every now and then. At the end of the day, Sultan is a Salman Khan film, a vehicle yet again to showcase his incredible star power.